For the nature lovers and outdoor activity lovers, trekking must be a preferable way of spending holiday. 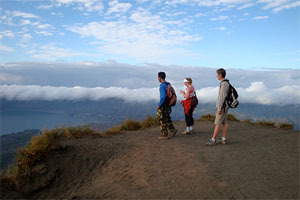 If you are spending holiday in Bali, try to do trekking in two biggest mountains in Bali, Mount Agung and Mount Batur. What will you need and what to know? All of it is discussed here. Mount Agung is the highest mountain in Bali, around 3.031 meters above sea level. This mountain is located in Karangasem Regency. Mount Agung is a sacred mountain for Hindu and believed as the resident of God. Because of its sacredness, the biggest Hindu temple in Bali, Besakih is built here. This mountain erupted in 1963 resulting severe damage to some regions in Bali. However, now this mountain is safe to be explored. This mountain has a very large and deep crater which is still active. Because of its height, from below this mountain looks like having a pointy tip, but actually the tip of this mountain is a round and large crater. The view from top of this mountain is amazing. You could also see the top of Mount Rinjani in Lombok, even though both mountains are covered by cloud. Please note that foods made from beef are not allowed to be brought here. This belief is related to the Hinduism because cow or cattle is a holy animal. 1. Southern route, from Selat passing Sangkan Kuasa. 3. Southwestern route, from Besakih Temple, which is the most common route used by the mountaineers. Mount Batur is located in Bangli Regency, northeast from Mount Agung. The height of this active mountain is 1.717 meters above sea level. This mountain has a wide caldera sizing 13.8 x 10 kilometers which is one of the largest and most beautiful around the world. Inside the first caldera, the second caldera was formed in circular shape with 7 kilometers diameter. Since 1804, this mountain has erupted 26 times with the last eruption happened in 2000. The biggest one happened in August until September 1926. The eruption ejected destructive lava which destroyed Batur Village and Ulun Danu Temple. Trekking on this mountain offers unforgettable experience. The best time to climb this mountain is in early morning when the sun is about to rise. At that time, you will be able to see the amazing panorama of Bali Island illuminated by the morning sun. Besides that, you can see the view of Batur Lake, Mount Agung, and Lombok’s Mount Rinjani. The starting point for exploring Mount Batur is in front of Jati Temple, Toya Bungkah, Kintamani. Usually, the people who want to do trekking here start their trip at 04.00 in the morning. The trip reaching the summit will take around 2 hours. Doing trekking in both of these mountains is possible. Maybe this schedule arrangement below could help you preparing yourself for great experience that awaits you there. First Day – Visiting Kintamani. Try to find a hotel in Toya Bungkah, at the foot of Mount Batur. Some of the hotels also offer facility for bathing in a natural hot spring. Spend the remaining day for preparation. Second Day – Early in the morning, you could start trekking to the summit of Mount Batur to see the sunrise, the view of Kintamani and also Lake Batur. After that, you can go back to Toya Bungkah. You still have time left before heading to Mount Agung, so have a walk to the tourism objects around Batur. 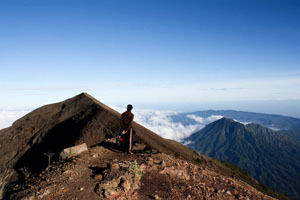 Before afternoon, go to Besakih (Mount Agung) through the route of Penelokan-Rendang. The trip will take around 3 – 4 hours. After arriving, pick one inn or lodge there for spending night. Third Day – Wake up early in the morning to start the trip to the summit of Mount Agung. If you prepare it well, you will arrive on the summit when the sun rises which once again will make you amazed. Explore more areas as you like and then go back before afternoon. You will arrive in your inn in the evening, so you will still have time to enjoy your holiday somewhere else in this Island. If you want to use travel agent, they will usually charge around IDR 2.500.000 per person. That price has included transfer to your hotel, entrance ticket to Mount Agung National Park, trekking equipments, sleeping bag, lighting equipments, food, and cooking utensils. Apart from that, you may need to prepare sun block, thick or warm clothes, sun glasses, and raincoat by yourself.